In 2016, director Jim Cummings’ Thunder Road won the short film grand jury prize at the Sundance Film Festival. That film, which focused on one man’s eulogy of his mother, was the beginning of something great and now Cummings has expanded his story into a narrative feature of the same name. That new feature arrives in theaters nationwide today. The short film focused on one scene as Officer Jim Arnaud (Jim Cummings, who also wrote the screenplay) stood, rambled and eventually danced in front of a Church full of mourners while speaking about his late mother. From being offended that people don’t say thank you enough to dancing along to the title song, Jim veered from topic to topic with his emotions changing dramatically moment by moment. The new feature film starts out with a similar sequence. Over the course of the rest of the movie though, Jim is brought more to life as we see him try to keep his life together while his world falls apart. Over the course of 90 minutes, he struggles to maintain a good relationship with his daughter while clearly traumatized by his loss. The versatile Cummings imbues his lead character with a wonderful off-center personality. It’s hard to fully understand the complexity of the character or know what his next move will be. At times, he’s disquieting in his pain — mulling around, believing that life gave him a bad hand. At other times, there’s an anger inside of him that transforms him into a vengeful soul. At other times, he’s a well-intentioned officer trying to please his supervisor. It’s a testament to the production here that Jim is allowed to be a chaotic jumble of emotions. He’s not a simple man and he’s tough to define but it’s also difficult to lose him in the story. He keeps our attention. The feature explores the daily life of his character as he engages in a custody battle with his estranged wife (Jocelyn DeBoer). Early on, we watch as he valiantly tries to build a real connection with his daughter Crystal (Kendal Farr), a girl who would rather spend time with her mother. The duo share a tumultuous relationship but there are great subtle moments here where you see the characters breaking through to each other. Throughout the movie, it’s these small moments that really define this character unique character study. A simple hand clapping game turns into a poignant moment of connection. A conversation with his daughter’s teacher (Macon Blair) turns into a moment of great despair. A talk with Jim’s sister (Chelsea Edmundson) turns into a moment of great discovery. There are admittedly other moments of great discomfort in the film, where the audience might be wondering if they should be laughing or simply empathizing. Cummings gives his character the room to be both a source of comedy (there are plenty of humorous moments here) and a sympathetic countenance that keeps the audience connected to Jim. 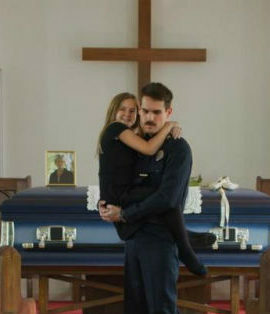 Thunder Road ultimately takes the short film of the same name to a different level here. The feature film takes the concept of the short film and really brings a fuller life to that complex lead character, capturing who he is as a father, as an officer and as a man. It takes a lot of vulnerability and openness for an actor to give so much to a role and Cummings offers that along with a film that will be hard to forget.